my poor husband has had a really crappy week. i am feeling pretty sorry for him. Monday- his truck started making a horrible sound. Tuesday- after dropping his truck off at the shop he took a State of MO vehicle out of town to work… it brokes down in the middle of an intersection. 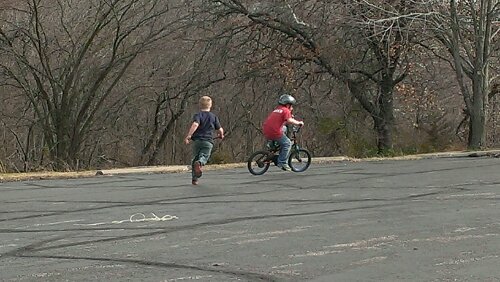 he had to push is up a hill and wait for a ride. Wednesday- someone tried to blow up his office (okay… that may be an exaggeration but there was a fire and it is being investigated as arson). the hubs lost all his stuff. While standing outside all day watching it burn and talking with investigators, he got a horrible blistery sunburn on his bald head. Thursday- Mizzou played a really crappy basketball game. I got home from a late meeting and found him sitting in the dark with a sad expression of defeat. Friday- just now as he was taking off his glasses to rub his eyes the arm falls off and the glasses end up in several pieces in his lap. He just looked at me and said that this has been one of the worst weeks of his life. He says he icing on his crap cake will be if KU wins the NCAA tournament. I feel bad for him… when it rains, it pours. It can only get better from here, right? Dude refuses to ride a bike. He has no interest in figuring it out. He says he can run faster. Bubba has found a way to get his brother to ride with him. 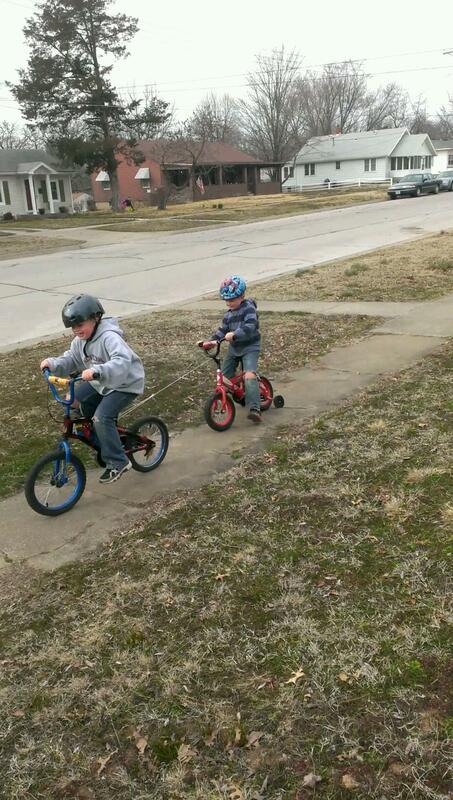 They rode up and down the street giggling- until Bubba turned too fast and Dude went flying. Then I laughed really hard. They also like to play tag. Dude gets to chase Bubba with stick sword and rope lasso while Bubba weaves all around like maniac. They giggle until Dude finally gets Bubba and whacks him with the sword. Then I laugh. Does this make me a bad mom?